Captain Andrew Strauss paid tribute to Kumar Sangakkara after his century denied England victory in the third Test at the Rose Bowl. Sangakkara's 119 helped the tourists bat until tea on the final day, after which rain forced an early close. "We got ourselves in a position to go on and win the game," said Strauss. "But fair play to Sangakkara especially, the Sri Lankans blunted our attack and we didn't make the inroads we needed to make." The tourists had begun day five on 112-3, 81 short of making England bat again. But stand-in captain Sangakkara shared a stand of 141 with Thilan Samaraweera to earn Sri Lanka a draw, handing England a 1-0 series win by virtue of their victory in the first Test in Cardiff. "We were a little frustrated not to take a 2-0 win," added Strauss. "I think we got ourselves into good positions in all three Test matches and in a way a two-hour session in Cardiff was good enough to get us one result." The left-hander struggled in the three-match series against the Sri Lankans, making 27 runs in four innings. In a bid to regain his form, the Middlesex opener will play for Somerset against India in a three-day match from 15 July. 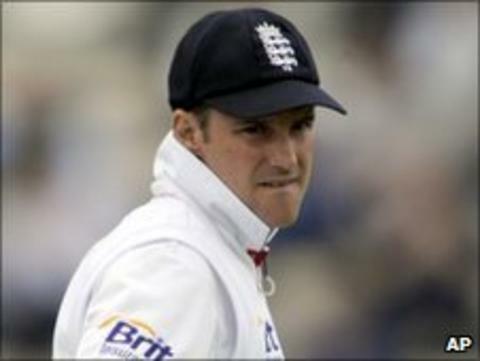 Strauss will then lead England in the first of four Tests against the same opposition a week later.